We've always had a thing in our family. Who will be the first to say happy "new month" on the first of each month. I'm up first. I get to do it! October... Can you believe it? A very nice guy who reads ifish, David, ordered me some Jaciva chocolates for a get well present. If you've never had one, you are missing out on some healing, powerful poison! The order form, he says, warns that it takes 4 to 6 weeks for delivery. This is awesome! Every day I wake up, and think.... I could get chocolate today-- or tomorrow-- or??? The river came up an exciting two inches! Wow! I keep thinking about how fun it is to watch the river grow and recede in the winter. Anyway, we round the bend and see a flooded river and we all say, "WOW! That's a huge river!!!" Right now, we all are stuck on the same saying... "Man, that river is low..." This one has been going on for several months now. When will I be able to say wow? :) When will I be able to sink my teeth into chocolate? There really is so much to look forward to, in every day of our lives. Today, I'm off again to hunt for those dang, elusive chanterelle mushrooms... It's the treasure hunt of Fall. I can't wait to exclaim, "Wow! I found them!" Then, I'll go home, sauté those little delicacies in too much butter, go out to the porch to find a box of chocolates, left by my wonderful UPS man, listen to the rain on the roof, and glance outside at the river. WOW! Now that's a river!!! Dee Dee is cuddled up at my feet. I opened the door for her to go out. She heard the rain. "Nah... just give me my cookie, I'll go later..."
Kilchis ran outside anyway. Dee Dee just grunted and turned away. I don't do my Jane Fonda exercise tape lately. I don't jog. I don't speed walk. I haven't been doing sit ups, nor stretching exercises. I hunt mushrooms, and I look like it. "Mom..." Andrew reached up and pulled a hunk of moss and pine needles from my hair. "You can't go in the store like this!" The doctor says I can see better, but I really can't, just yet. Everything needs to settle before they can fit me with contacts or glasses. Even then, I can't see what's stuck in my hair. I hunt mushrooms, and I feel like it. My muscles ache, morning and night. I stand up, and my back creaks, my knees protest, and my shoulders are stiff. I spend my free time driving slowly on coastal logging roads, searching for the right kind of forest growth alongside the dirt roads. Salal, Oregon grape, Douglas Fir... That's the recipe! When I find it, I stop, get out, and begin my search. It's a self propelled workout. Up hills, down hills, I just can't stop. Most often I am so totally absorbed in my hunt that I think of nothing else. Chanterelles... where are you? Under here? Over there? ... nope. "See that ridge up there? That's hard to get to. They must be up there!" Sometimes, however, I stop and listen. I hear something move in the brush and my heart starts pounding. I wonder what the heck I'm doing out here, deep in the woods by myself. I run to the car, tripping over limb and brush, making as much noise as I can, open the door, I get in and lock the door. Whew! Breathing heavily I feel 'by golly' lucky I wasn't eaten by that bear-lion-tiger-cougar-monster. Yesterday, Bill and I drove to the Riverview Lodge on the Nestucca River. They are joining ifish in the Top Accommodations area. I took pictures of their beautiful property for their ifish web page. We watched the salmon jump on the river, where their dock sits. We shook their hands and left. Great people! On the way home, we took a logging road in search of.... yip, chanterelles. We didn't find any. We giggled about the fact that it is quite like snipe hunting. When I got home, I viewed the digital pictures, sorted them out, compressed, resized, and reshaped them for web use. I needed a break, after working. I pulled on my boots, called Kilchis, and crossed the river to get to the deep dark mossy woods in search of.... yip, chanterelles. Chanterelles are hard (for me) to find. They must be on the other side of the river! I climbed hills I didn't know how to get back down off of. But never mind that. After finding no "snipes", I named those trails "fanny falls", sat down, and slid on my backside, back down to the river. It's raining this morning. Rain is food for the chanterelles. Soon they will pop up everywhere, and prove to me that chanterelles are not snipes, right? They are mushrooms. They do exist, and I will find some. Salmon? They live in the river. I know where they are. I can catch those things. I know how. Chanterelles? Well.... I'll find those pesky devils. I'll find those zipperlip forest pockets of my so called 'friends' who fill their buckets and send me pictures of their catch. In the shower this morning, I noticed pine needles, a couple salal leaves, and assorted tell tale signs of my adventures. I reached down to wash them down the drain. Hey, wait... the shower is moist, we have all the right ingredients here. Water, pine needles, moss, salal... Jen, get a grip... There are no chanterelle mushrooms here. *When am I ever going to learn that I don't need a contact case before I go to bed? I don't wear contacts anymore! I also search in the morning for my contacts to put them in! I had to hide them, just in case I try to put one in, in my sleepiness in the morning. Now, THAT would hurt my surgery healing eye! *Never, never, assume just because you are almost all the way across the river, that you are there. I think that every time I cross the river. I'm three feet from dry rocks, and I begin to get careless. These rocks are still slippery, if not more slippery! One day I will fall. I know that! It is like that rule that automobile accidents happen close to home. *Someday soon, I am going to leave early in the morning, on my own, and make my way upstream in a local river, to tidewater to catch a salmon with no one but Kilchis with me. *I have to get in the shower and get going. I will not put in a contact. *A couple of hunters are out in the woods when one of them falls to the ground. He doesn't seem to be breathing, his eyes are rolled back in his head. The other guy whips out his cell phone and calls the emergency services. He gasps to the operator: My friend is dead! What can I do? The operator, in a calm, soothing voice, says: Just take it easy. I can help. First, let's make sure he's dead. There is a silence, then a shot is heard. The guy's voice comes back on the line. He says: OK, now what? Watch closely for the new virus, Bugbear. I have gotten a couple copies. That red screen of Norton death popped up, could not repair the file, and I had to delete it. It's been a while since I have seen it. The ISP e mail filter did not catch it. Do an update on Windows Explorer too, and set your computer, on that page, to automatically notify you of updates. I update my virus info every day. I think that once you have a virus, you will learn that this is the only way to stay protected. Even so, never, ever, open up anything that you aren't expecting, no matter from anyone, even if you know them. They may not know they are sending out harmful files. Bill and I went on a chanterelle hunt the other day. 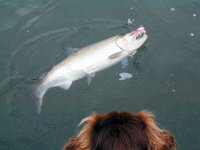 We had fun, picked up a summer steelhead on the way home, and were set for dinner that night. How much would you pay for a dinner like this? Add some roasted garlic, wild rice, summer squash and fresh tomatoes! Thank God that Bill found the first ones. He was really concerned about snipe hunting, and didn't want to be made a fool of. We wandered deep into the woods, and occasionally stopped to catch our breath. It really is quite like my favorite part of fishing.... the hunt. We drove around, looking for the appropriate ground cover. We stopped, got out, looked around, and if we didn't find any, back to the pickup we went. Dang we love our Frogg Togg rainsuits! Light and airy, and perfect for sloshing around in the woods. Contact me if you want to order some. I'll put you to the right people. We sweated and tromped around, probably getting the best exercise either one of us had had in quite some time. After a particularly vigorous stop, climbing a hill and finding nothing, we met back at the truck. "Looks like there should be chanterelles here..." I said. "Yip". Bill noted. "Perhaps we should try plunking." "What do you mean, Bill?" "Just sit down and wait for them to grow around us." That's really not a bad idea. I bet anything that in a few days the whole area will be full of them. I do believe that it is early. Nonetheless, we found a few early feeders, and have been enjoying chanterelles with salmon, with cornish game hens, and with stir fry the last few days. I do like plunking, but I think I prefer drifting for them more. It's good exercise, and when you do find them, you can't help but scream, "Mushroom on!" The last few days and the increased flow in the water have brought the cutthroat to my backyard to play. I caught and release two of the biggest cutts I have on record. One, at 20 1/2 inches, and one at 18. Big, fat searuns that make me smile. Fall is here. Salmon and Chanterelles, a fire in the fireplace, and a clean house. I'm going to stop on the way home and hunt for a closer place to collect Chanterelles. Wouldn't it be embarrassing if I have been driving over an hour to find them, and find out they are right in my own backyard? I really think it's possible. Have a great day, light a fire, cook some chanterelles and smile. What does a typical day of running ifish require? 5:00 AM... whether fishing or not-- Open Eudora and start filtering through mail. I have a filter for pay pal, and I check for decal orders. I grab decals, always include an extra one with their order, and start making out envelopes full of decals, address them, stamp them, and set them in the out box. Then I start deleting spam and figuring out what real mail I have. I answer questions, some common ones, I have template answers for, such as, "How come I can't use my back button on Explorer for the board? It doesn't show the new topics!" Well, that's because it is a known Explorer problem. If it is known, why isn't it fixed? I always use the bottom link where it says: The Ifish Community, Go Fish!-- It works for me. Some people write to me thinking they are writing to one of the Top Guides or Charters. I forward them on, or tell them how to reach that person. I answer letters of interest in advertising, although, most often, I don't have any room left for advertising, and I put them on a waiting list, and save them to a folder in which category they want on. Many people ask for a change of their user name. We don't allow them to change their own user names because it gets too confusing, so I approve or deny the request, and manually change it for them. This is a two step process, and it takes a while. Not one of my favorite jobs. Now... It's time to take a look at ifish. Perhaps I'll check the stats. Then, I'll wander over to cnn.com and see if our world is still intact. (Oh brother). Perhaps I'll take a check of the weather here. OK, back to my e mail. I'm on a newslist for Marfan Syndrome. I briefly go through that, although I often skim. It's depressing to read, at times. If I read too much of it, I get unhappy and start focusing on medical issues. Yuck. Wow! Check out the Salty Dogs! A 102 pound tuna? I think I'll stick with salmon though! Let's wander over to the classifieds... I go through and look for "SOLD" posts, so that I may delete them. Then, I go to the admin panel and prune them to the last 90 days and rebuild the search index, so that it reduces space on the server, keeping things running at a good clip. The hard part of running ifish is trying to protect ifish clients, and keep the board within the rules we set. Many people want to get their business in front of 4000 people a day, and it's difficult to tell them it's not alright. I set the rules, I intend to keep them. The people on ifish pay for a fairly exclusive right to advertise. Otherwise, what would be the point? Sometimes I have to add a new rule, due to a new and crafty way someone has found to get around the user rules. Argh. Why can't people just talk fish? I try to keep it family oriented. It's not always easy. Sometimes there is a sexual overtone, and as long as it might go over the heads of some, I leave a little of it. It just depends on my mood. It's a case by case decision. Many times, I have to call on the moderators and ask their opinion. It's tough for me, as a woman, to run a forum that is dominated by men. The moderators work is invaluable to me, and I appreciate them so much! Yes, I'm human. Sometimes in the evening, when I am tired, I look at the board and think everything in the world is negative, and they are all trying to pull the wool over my eyes. It is times like these that I have to walk away from the board and go to bed. When I look at it in the morning, it makes an amazing difference! Perspective! AMEN! For the few letters of complaint and tough decisions that I make, there is always a flip side of wonderful "thank you" (I haven't kept up on that page!) notes of appreciation, and sometimes, even an offer for fishing or a place to stay while I'm in Portland, and a dinner invite! Well, it's 5:46. I've written this column, filtered through mail, briefly checked the ads, and mailed out some decals. Yes, I have some ad quotes to send out, some billing to do, and some banking. I have to think out a new page for a new product, I have to write an article for the OWAA tech letter. I have to repay for the UBB members area. I have to do research on the members directory for ifish. At this point, it's usually time to start work on all these things. It's time to set meetings with people that I have promised to meet with for three months and it just never seems to happen. So... Bill? Shall we fish? Tomorrow it's off to the doctor in Portland. Today? Really... I have nothing else to do! Off to the doc to see what I can see. Yesterday was a blast. Went to the Nehalem, and the silvers were doing acrobats all across the river! It's really good to see the native run so healthy for what, three years in a row now? The whole river was an explosion of silver fireworks splashing all around us! 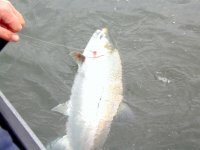 I did hook a large 15 pound silver, and played it quickly to the boat. Released it unharmed. Funny, what did I catch it on? An Alvin! There were so many silvers that one hit the bottom of the boat, and one nearly jumped in with us! Amazing! I got home, feeling guilty about leaving Kilchis all day, and took him down to the river after dinner. I fish for cutts half to experiment, and half to bide my time as Kilchis chases dippers. The water is really low again. I remembered Mark, of First Cast Jigs telling me that these really small jigs, tipped with a bit of crawdad tail were like candy to cutts. So, I tried it! I tossed it out, Thill bobber and jig, into the fast water at the head of the pool. It follows the rock wall across the pool, in a circular manner, and works it's way all the way around to a big boulder at the tail out. I followed this pattern, mesmerized by the colors reflected in the water, over and over. Bright reds, yellows, and orange leaves shimmering, mirrored on the water across the pool. Occasionally a new maple leaf would fall, gracefully and land on the glassy surface. I began to test my new eye. I closed my other eye, and tried to follow it. It wasn't easy. The little yellow tip of the Thill was barely visible to my new eye. It was like looking through a kaleidoscope of glassy shards. In fact, I saw three or four faint, but bright yellow bobber tips! With concentration, I did follow it (them) around the river flow's path. Kilchis was off howling and yipping at a dipper. I continued my concentration, one eye shut. "Please God", I said, as it settled by the boulder at the end of the current. "Please, let me see a bobber down with my new eye". Just as I said that, just as the thought of seeing it, materialized in my brain, it happened! I set the hook to a lovely 15 inch cutthroat! "God got me a fish, Kilchis!" I yelled to no one in particular. With the kaleidoscope effect that my eye gave me, I half expected to bring in three or four fish! I can't wait to get glasses or contacts to adjust my sight. So, it's off to the doctor this morning, to find out why I am seeing multiples. It's not all bad, like I said. I mean, think of it... When you hook one fish, you actually see 4. It's a mighty quick way to limit. Why can't anything ever be easy? I'm bummed. I have an infection or something or another on my newly sighted eye. A cyst on my incision, or something. The doctor is hoping it will go away, but I may have to have surgery again. It's hurt for about a week now, and I was afraid to call the doc. My eyesight isn't as good as it was, but close. I wish I would have called, dangit. I did call once, but I told the guy on call that I didn't want to bother anyone. He asked if it was an emergency. I said, "Well... I don't think so." So he said to call back later. I didn't call back. I have a new batch of fun medicine in all shapes and sizes. It's not quite like a 'gift with purchase' from Clinique, but hey... it fills up my bathroom shelves! I'm getting nearer and nearer to my planned escape down to tidewater, to catch my chrome chinook. I have to get some solid sleep, thus, this trip is necessary for my health. I've been planning during bouts of interrupted sleep. Even the bobber down part, which wakes me with a bolt nearly every night. Some people have nightmares... I have bobber-mares. All of the sudden, I find myself sitting upright in bed, sweat dripping from my brow. What was it? A bad dream about falling? A cougar chasing close behind me? A bobber, submerged in water. It's tragic. They always say you wake up before you die, in nightmares. For me, it's true about bobber downs. I always wake before I even get to feel the fish! Once I even jerked back, and I thought the dream was going to go alright, but there was nothing there! Terror! The bobber came flying out of the water and aimed right at my head. The same recurring dream, night after night, about a bobber, laying placid, gently working with the outgoing tide, in tidewater. It seems I watch it all night long, and finally, finally.... it gently goes down. That's when my heart begins to beat madly. At first, I think it is a mudcat, and then it goes all the way under and to the right a bit. Why can't I sleep through to the end of the story? Why can't I dream about the finish? The landing of a 40 pound chinook! That's what makes my dream, a nightmare. That's what wakes me bolt upright. The only way to end this madness, is to actually finish the job in real life. Sometime next week, I'm going to dress in hip boots and jeans and "put in" at the lowest public boat ramp on one of the local chinook filled rivers. I'm going to start walking down river, holding my Lami close by my side. My old bobber bag will be tossed over my shoulder like a 20 pound boulder. :) Filled with crusty jars of eggs and bobbers and one ounce weights, it will catch on trees while I attempt to work my way through the brush. I'll cross the river when the brush gets too thick, perhaps on an unused trestle, perhaps through water that threatens to pass the height of my boots. I'll quietly round a corner, where a heron squawks madly, disturbed by my presence. Suddenly, I'll come upon a deep, still, pool. I'll study the bank to find just the right 'fish blind" to set up. 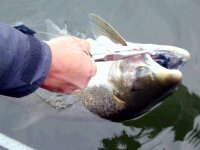 Mighty pacific salmon will be creating smooth, deep wakes, caused by their frustrated roaming. They want nothing more than to make it upriver. This is where my nightmare will end. On another note, Chris Sessions came to visit night before last, and made the most outrageous deep fried halibut dinner. When I deep fry fish, it's such a mess! Chris brought halibut that he caught in Alaska, a deep fryer he bought at Costco, and all the makings for tartar sauce. Yuck! Miracle Whip? You are going to make tartar sauce with Miracle Whip? I hate Miracle Whip! Know what? I didn't hate it! It was the most outrageous tartar sauce I've ever had! The whole dinner was awesome. Halibut, chunked into 2 inch pieces, dipped in his "secret" (hah!) Krusteaz breading. No messy batter, just a light coating of plain Krusteaz crumbs. Deep fry till done. They were beautiful, and so good! I always thought deep fried dinners were heavy, messy to prepare and even messier to clean up! NOT! I made a quick cole slaw and dinner was served! YUM! The last two days I have been a fishing fool. I've done nothing but eat, sleep and fish. Back to work, and back to my nightly bobber-mare.... I have to work on ending that, so I can get a good night's sleep. It can't happen out of a boat though. I have to do it myself. No more bolt upright sweats. No more waking on the wrong side of the bobber. I will dream sweet dreams of bobber downs, and blissfully sleep through the landing of a 40 pound chinook. A sweet dream, in full color. I am laughing so hard I can't stop! I can't seem to settle down. All I do is fish lately. 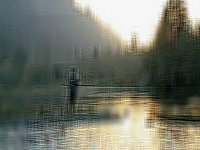 I promise myself I won't fish, and then I find myself, rod in hand, on the river somewhere. I crave a day at home with my pajamas on. I crave rain, and wind, and sleet and snow, and fires in the fireplace, and stew on the stove... but it's still sunny as I squint to make sure my bobber is not under water. The weather forecast predicts "sunny" one day, and alternates "clear" the next. Is that to break up the monotony? My hands are crusted with egg goo. My clothes all have spots of pink cure on them. They need to be washed. All my fishing rags are used, and thrown at the base of the washer. I need to vacuum and dust the house, but I brush past it, to grab my rod and reel. I need to clean my computer screen and keyboard, but instead, I grab a towel and clear off the spattered cereal the kids left, and the sticky chocolate on the mouse, do my work real quick and head out to the river. Today I drive to Astoria to play for church. I just realized that this will be the first year I haven't fished my jack hole in Astoria, if I don't get my act together soon. I don't know why I have a container of eggs and my jack rod in the truck. It's just there. I plead innocent when I am confronted with the tackle box and a dirty rag tucked under my truck seat. God help keep me straight to the path of church this morning. Keep me from whizzing by, waving happily, and heading out to my favorite hide out, beside the river, where the jacks play. It's so awfully close to the church. This is Erin, Marty's client. Erin hooked this beautiful hen while we were onboard. Talk about fun! Later in the morning, during an ebb in action, Erin decided it was getting warm, and needed to take off a layer of clothes. He set his rod in the rod holder... "just for a second". "What was that?!?" Erin yelled, turning around, trying to grab his rod. "It's a fish!" Says Marty. "Rods don't go zing zing zing when they are just snagged on the bottom!" Missed that one, and his friend, Bonnie hooked one, and that one didn't stick either. I'm not sure how they did the rest of the day, but the morning was so action packed that I'm sure they had a great day! We saw Len Self putting on a clinic with his clients, too. I said hi to him in passing, but he was too busy with a fish. Why wouldn't he talk to me? The answer was in my e mail box this morning. Just a little busy netting a king salmon! "...52 pounder is the biggest fish of the year for him. All were chrome bright with lots of fresh, long tailed sea lice". I love to wake up to this kind of e mail! How bout this one? 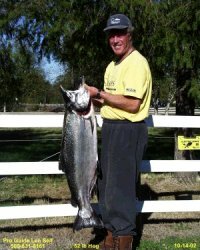 "I caught this monster this weekend on shrimp, --nice bright fish still had sea lice on it". Dang I love this time of year! But... I came home to the awful realization that yes, I have been a fishing tramp for too long. My bills are stacked up. My computer work is stacked up. My housework is stacked up. My yard work is stacked up. I have phone calls to return, and meetings to meet, and letters to letter and computer projects to compute, and articles to write. So.... I grabbed a glass of ice water and headed down to the river to ponder it all. You know, to organize my fishless thoughts. Half of the expanse of river beach, about the size of two city blocks, now stays wet all day long. The long shadows of Fall protect this area from sunshine from dawn to dusk. Soon... soon, there will be salmon here! I found a spot still warmed by the sun, on the North end of the river, just as it curls and runs slowly toward the sea. I sat down on a dry log, pulled off my boots and wiggled my bare toes in the sand. I began to sort through the things that I needed to do, as the dogs raced on the water's edge, and dug holes in the sand. I stared out at the water, and imagined it full of salmon, once the water comes up. What a place to live, if you expect to get anything done, I thought, and groaned. Salmon to my right, salmon to my left, salmon all around me, as far as I can imagine! There is salmon in them thar trees, I thought, as I realized the dead salmon carcasses from years back feed these towering monsters around me. I did get my check book balanced. I did wash a load of clothes, later. I had too. I have to buy bait, and I can't fish naked, now can I?!? It's off to the doc in Portland today, but tomorrow.... tomorrow I'll get my bills paid! Sitting in the boat, checking book and calculater set neatly in my lap as my bobber floats carefree beside me. Today is Don Larson's 45th birthday. 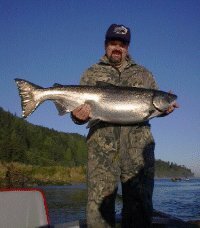 I've written about him, and linked to his page, The Sturgeon, Salmon and Steelhead page, many times. He was my first real internet fishing buddy, and we traded links. I'll never forget when we were so excited because Bill Monroe posted something in the paper about our sites. You may read that here. Don's boat was found, with the motor running, on the Columbia River. They have searched for Don for a couple days now. They are still looking for him. This is the picture that I have in mind of Don. Laughing and eating, while I encouraged Don to do Jane Fonda warm ups with me onboard. We were freezing, and I wanted to warm up in the sleet that was falling, as we fished for sturgeon in Tillamook Bay. We got fish. We had fun. 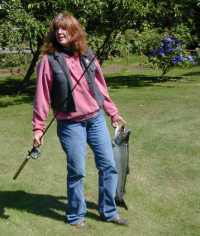 We later fished for steelhead, salmon, and also fished for ways to get more hits on the internet together. We promised each other we'd always keep each other linked on our sites. He took Andrew and I out to lunch at Fridays, when Andrew was going through awful medical procedures. Don would also call me at night, when dramatic things happened on the ifish discussion boards. He wanted to make sure I was OK. I was not. I was in tears. Don made me feel better. 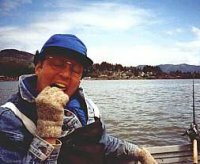 Although Don seemed to lose interest in his page after a while, and spent more time on the river, we still kept in occasional touch, and I have very fond memories of him. Don? Where are you? I'm still holding out hope. Was it what I ate? I had the goofiest dreams last night, all night long! I woke up three times in the first hour, with fishing nightmares of one sort or another, losing my bobbers, or breaking line. They all woke me with a frustrated start. All of the sudden I hooked a huge steelhead... I thought. I played it for a while, but it nearly pulled me in! I was holding the rod out vertical, because I was afraid the line would break. I had to sit down on the dock, and brace my feet against the edges of the dock to help me from getting pulled in. Finally I saw it! 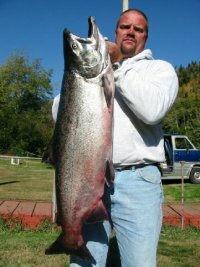 This was no ordinary steelhead! It was a platypus with a goofy look on it's face! "Oh no!" I felt awful! I didn't mean to hook a platypus in tidewater!!! I searched around to release him. NO PLIERS! "Oh no again!" I held the line just a foot from his mouth, trying to dislodge the hook. I thought that this would be easy, this is 10 pound line. But no! Whatever line this was, I'm going to use it, because it wouldn't break! Finally, I got it out of his mouth, and he didn't swim away. He became this goofy cartoon character that liked me! He wanted to play! Now, this is too weird for me. They say you wake up from dreams right before you die. Well, I woke up right before I died laughing. Want a great start to your day? I had a boyfriend of the rather cosmic type when I was a young college student. When having coffee at his house, in the morning, we would do a yoga exercise he taught me. It's amazing and fun how it works! Sit closely opposite a friend or partner. One person begins by slapping their thigh, and mimicking a laugh. "Ah ha ha ha ha!" Whether you feel like smiling or laughing or not, you say those words. Now it is your partners turn. Slap thigh and say "Ah ha ha ha!" Take turns and do this until you are both in stitches! It works! And it's a great start to your day! TRY IT!!! Andrew and I did it yesterday on the way to his doctor appointment, and I had to pull over I was laughing so hard! It helps, when you are stressed by things. I'm stressed with the condition of my surgery eye. Funny, the nurse, when I asked her a question about my eye, said, "Well, Jennie, in a normal eye, this this and this would happen... But you... You are such an..... Oddity". Her face contorted as she said it. I have to do antibiotic eye drops four times a day, prednisone three times a day and refresh tears inbetween! I have a pocket full of medicine wherever I go! What a pain! They'd like to do surgery now, but can't until my eye settles down. When it does, in three weeks or so, back to the operating table to cut some of the stitches to help me see better, and to try and fix the hole. Perhaps a schleral implant again? I don't know. Anyway... Just talking about it makes me upset. I think I'll go get Bill now. Think he'll play? Slap my thigh, and say. "Ah ha ha ha!" We are going out fishing in an hour or so. Hope I don't catch a platypus. By the way, I am writing for the OWAA tech letter, and I posted my first article here, just to have people read it and see if it is understandable. Please feel free to read it, and send me, or post your comment. Not one platypus in the Nehalem that we could find. We did, however, find plenty of silver action. I would say, perhaps 95 percent of these silvers are native. Kilchis looks on as we land another silver. What a recovery. Bout time we let the fishermen keep a couple? I'm not sure how I feel about that yet, but I'm considering that. When a run is looking healthy and recovered, is it due to ocean conditions, or is it true recovery? Only time will tell. Anyway, interesting story yesterday. I was using a pink and white K13 on these fish, after fumbling around doing the gear test thing. I tried these new wobblers that you insert scent into. Nada. I tried another kind of wobbler. Nada. I tried a small spinner with a skirt on it. Nada. OK! Get out the K 13s! Fish after fish after fish attacked this lure! I removed the top hook to make it easier to release. 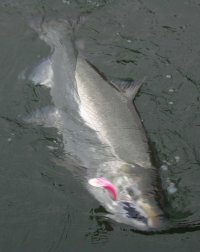 Those silvers, unlike chinook, like to "spin" when they are hooked. It makes it extremely challenging to release them unharmed, so please, be careful! Bill gives the hooks a quick jerk, and the silver is on his way. After several successful releases, we landed one that had wrapped himself up quite significantly. What to do? Argh. We attempted to remove it, and were not very successful. The fish finally broke the line, and bye bye pink and white K 13! Silvers spin while being landed. I was bummed, but at least, I thought... the fish would rid himself of the hooks, and be OK. This turned out to be untrue, as minutes later, a seal, honed in on the fact that this silver was struggling, grabbed the fish and ran. Next thing we saw was a seal with a K 13 hooked up tight against his snout. I felt awful. Bill, not quite so awful. The demise of this one silver, may save several others. The seals sore mouth may cause him to be a less effective hunter for a couple of days, while the rain comes, and helps these silvers upstream. I felt a little better.... I think. No matter how upset I get when these seals and sea lions grab and eat (and waste) fish, I still have this Pollyanna feeling about the suffering of any live creature. So, if you are in the Nehalem and see either a pink and white K 13 floating in the river, or in the nose of a seal, that's my lure! Most of the fish were in the 10 to 15 pound range. Last time we were out, I hooked one that was near 15 pounds or so. Huge! Today, I have a craving for peanut butter cookies. Yes, they are for breakfast. :) Have a great weekend! If you are looking for something to do with your kids this weekend, silver action is pretty good on the Nehalem. It helps, when you don't have to wait, and wait, and wait.. like fishing for chinook salmon. It'll keep them on their toes! FISH ON! Allow me, please, just one column to tell you how very frustrated I am with my new vision and eye. I wish I hadn't done this surgery. Perhaps they will be able to fix it, perhaps not. No matter, if they even can fix it, it will mean more surgery, more tests, less days fishing and more days wishing. Last night, I tried to read with my new eye. Not a chance. It made me feel so helpless. Even my old eye could read, if I held the book up close enough. One of my frustrations has always been to try to explain to someone what it is like. With the modern advantages of a digital images, I can show you! This is for my family, mostly.... But here goes. That was enough for me to weep last night. It was so frustrating, and hit me so hard, mostly because I was tired. I feel better today. It's like it's blurry and too sharp, all at once. Now, combining these two together, it's no wonder I live with headaches all day long, and have to go back to physical therapy this Thursday for my neck and shoulders. I am straining to put together these images, and computer work makes my neck hurt! I have to lean forward and squint a lot. The disability office ordered me some kind of equipment that brings your monitor up and out to see closer. It's meant to help me see, and ease neck pain. My monitor, however, a 21 inch, weighs too much and it collapsed! Uh oh! One thing my other eye, although blurry and weird, does provide, however, is a bit of depth perception. For that, I am grateful. -- Or? Will I run away and hunt for mushrooms instead? The forest is always soothing to me, blurry, or not. I was kind of enjoying basking in my pity party. "Poor, poor, Jennie's eye!" They found the body of Don Larson yesterday. Another friend casting memories for me. Another soul that will make being on the river mean just that much more to me. Whispering "Hi Don" in the wind, as I fish. Gary Krum is battling cancer, and is struggling to maintain a balanced pain medication program. Milton Fischer is another friend that will be greeted on the Nehalem, as I fish past his house, remembering his sunshine smile and warm greetings. I worry about Ginny and Glen. Glen just had another heart surgery. I hope he is still doing well. Mike Schoenwald... I met him briefly at the PC ramp, and was looking forward to seeing him many times more, as I fished the Nestucca. It won't happen. Mike is gone. Last night we received a phone call from a friend battling prostate cancer. He wasn't satisfied with his PSA levels. Time for 8 weeks of radiation. Trips to the office, daily. And I complain about appointments every week! Someone knock me upside the head, k? Yeah, my eye is blurry. It hit me like a rock. I had been basking in letters from friends who raved about what they took for granted. Something as simple as sight. Well, folks... Last night I had to swallow a big lesson. I have been taking life for granted. Concentrating on something as simple as my silly eye. I could live without any sight whatsoever! I could still be as happy as a clam! Take my sight! Take my sense of smell! Take my hearing, but God! Let me live! Without all of these, I could still fish, still breathe, still love and be loved. I'm getting over it and on with it. Time to fish, time to smile, Time to live! By golly, I'm still here! Life is so very short, and so very precious. I was rather put off, when my doctor said, "Jennie, compared to world events, this is insignificant." Another cup of coffee, and a new in-sight into life and fishing. The vine maples stand out against the hillside of faded green firs and hemlocks with hilarious colors. Their leaves are hanging by a thread, waiting for the storms. Waiting for the rain. One breath of wind and they'd be gone! and the trees sag in their holiday dress. Fall has lasted a long, long time this year. Every morning I wake up, run downstairs to the computer, check the temperature, check the rainfall gage, and click on the weather page. "There is a strong low pressure system moving in from Alaska." I, instead, am transported back to reality, with a California style forecast. "It'll be another gorgeous, sunny day, folks, with a high near..."
The forecasters goofy smile brings on nausea. What are they so happy about? This is Oregon! I stand beside our current-less river-turned-pond. The glasslike surface perfectly mirrors the stand of trees, and all of it's varied colors without a wrinkle. I shatter it by throwing a stick for Dee Dee and Kilchis. The river is the lowest I have ever seen it! The summer scum coats the exposed rocks that I thought would be gone a month ago. The salmon in the tidewater downstream are turning dusky and dark. Their frustration level must be driving them crazy as they circle in the last deep pool that prevents them from fulfilling their mission. I need to move on to the next season! I need to be washed ahead into winter by a rainstorm that erases the bright yellows and reds from the forest. Blow those leaves off of those trees, send them to the river, and take this season out to sea! Instead... I wander upstairs, take a shower, dress for the cool new temperatures of fall, and smile that nauseous smile of sunshine. I'll pick another crop of beans. I'll plant some garlic. I'll take the last tomato from the vine. It's another gorgeous, sunshiny day, and I had better get used to it. It will change, won't it? Lessee... It says 5:46, but it's actually 6:46, right? How many times does this thought cross your mind after day light savings time changes? Too many, I'd guess. I have a very strong internal body clock. So much so, that I rarely need an alarm clock. I despise the sound of an alarm with so much internal gusto, that I wake 2 minutes before it goes off. I can't relax enough not to set it, but I rarely, if ever, need it. This internal clock means that it takes me weeks to change over for the time changes. Rain. Well? We got a teaser, if that. Interesting though, we saw it coming, and began taking intermittent glances at the Kilchis Canyon Weather station and rain gage. It wasn't recording anything! A month ago, we noticed the temp gages were off. A check to the electrical wiring under the house told us that mice were chewing on the wires. Bill repaired it. Guess what? More mice to the rain gage wires! Why would they chew on wiring? It's scary! What about electrical wires? YIKES! Anyway, we repaired it, and wallah! We have a rain gage! Now, all we need is rain! Bill took a glass of water while I checked to see if it worked. It was so fun to watch it digitally click and add up the "rainfall"! Now, I want the real stuff, but it doesn't look like it's on it's way. I have work to do today, but I think that instead, I'll go fishing. It's my work, right? Writing about fishing? That way I can write about fishing instead of rain gages. The vine maples are still just gorgeous! Interesting, I found a picture on the net, if you click here, that shows... nearly exactly, how I see out of my new surgery eye. Or you can rejoice because thorn bushes have roses. "Jennie, not only do I not want to do surgery on you again, I loathe the idea!" That was the last I heard from my surgeon, regarding the triple vision I am experiencing, before he merrily waved good-bye, and said, "See you in a month or two!" What? Live with this for two more months? When I was little, I got hurt a lot. I fell because of the hypermobility I have, from Marfan syndrome. It seemed I was always wounded. I adopted a not so endearing nick name of "tissue paé paé". (In a sort of French accent). Interesting. After my doctor said he didn't want to operate on me anymore, he said, "Jennie, trying to sew into your eyes is like trying to sew tissue paper together". I thought that was sort of fitting. Wait till I tell my mean brothers, that they were right! I kind of get the idea that this is the way it is going to be. I see triple, and there is nothing he more he can do. There is an eerie looking prosthesis contact I can wear, that makes me look like a Halloween character. It occludes the pupil, so that it only takes in light from the small pinhole in the center of the contact. It is painted black on the inside, and then painted to look like a real iris on the outside. It's spooky looking. I tried it on. Yuck! It did work, somewhat, I think??? See my intraocular lens? It is right dab in the middle of the pupil, and therefore, refracts light multiple times, thus, producing multiple images. I asked him why this happened. The iris sphincter tore--or something like that, during surgery. Oops. I am so frustrated because it's so complicated! --and... my doctor does not seem to care! I guess surgeons see this stuff so often, they just get callous, and yell out, "Next?" There is one surgeon at Johns Hopkins that works on many marfan patients. I sent her an e mail, along with the picture. If she can help me, I'm taking all those mail offers for visas, signing up, and buying a plane ticket to single vision. It sort of brings it all very close to home and heart for me. If my eye tissue is really this fragile, is my heart tissue also this fragile? Really? Is Andrew's? Is what they have said about us having an aortic dissection early in life, really possible? Have I lived my life joking that it would never happen, been me hiding from the truth, and laughing it off? I laugh as I fight a fall salmon, knowing full well that my cardiologist thinks this is poor marfan management. I'm not to do isometric exercises. I'm not to lift over 20 pounds. I do, and I really don't think I'm going to stop. Fishing is what brings joy to my life. So? I'll see three salmon on the end of my line instead of one. I guess it's not all bad. My connective tissue may be like tissue paper, but I'm not... NOT NOT going to let my spirit become such. Amen, and back to the river I go. Trick or Treat! It's Halloween! This gives me permission to eat as much chocolate as I want! I searched through all my October archives and began to realize... every October for me in the past four years have been full of days fishing for Salmon in the Kilchis River. Please take the time to enter Scott McKnight's contest before I choose the winner, tomorrow or the day after. Today I've got a meeting with Jerry Dove, Lindsay Ball and Joan Dukes. I'm afraid of what I might hear, but I'll sure let you know. Have to take my truck in to Tillamook Motors and have it worked on. Then, on to Physical Therapy and to pick up a friend of David's over in Oceanside. You know, it's so strange to have it be October and my life not full of fishing. I don't remember a more fishless October. Not even as a child, fishing with my Father. It feels empty and strange. Yesterday, I drove Kilchis and the boys out to the jaws at Bay City to play frisbee on the beach. Of course, I accidentally threw the Frisbee over to the ocean side to see who was fishing the jaws. Just as I peeked over the edge of the jetty, to grab the Frisbee, there it was! A fishing vessel, being knocked around by the backwash of ten foot breakers, landing a salmon! He was edged up, perhaps 15 feet from the rocks, and working his way up river, while bonking a fish. That was so good to see! There are still fish, somewhere, out in the bays and oceans! It revved up my fishing dreams! I am worried, however, for the fish kegged up in tidewater. Bobbers splash overhead, monotonously, while gobs of eggs tantalize them. What a decision they have to make! Take the bait, or hold out, waiting to fulfill their mission? How many days can they resist? I understand the Sportsman's point of view, and the conservationists. Nature always handles these problems with much more accuracy and success then we do. On the way back from Portland, the other day, I was treated to a vine maple storm! It was so awesome, I giggled while I drove! The first big wind must have hit these trees, and for a solid quarter mile, I was engulfed in vine maple leaves swirling around me! I don't mean just a few, I mean whole trees worth of reds, yellows and browns! I had to slow down to 25 miles an hour to be able to see the yellow line in the center! I was so tempted to get out of the truck and whirl around in it!